Covering your roof with grass and plants is just one way of having a ’green roof’. In fact, sustainable roofing systems that offer long-term environmental benefits is the all-encompassing definition of what a ‘green roof’ is. There is a wide range of improvements that can be made to your home that can make a big difference to your energy usage and utility bills. These improvements don’t have to be expensive, and most people can incorporate one or more strategies into their own home quickly and easily. As the name suggests, cool roofs reflect sunlight and absorb less heat than a regular roof. Lowering the temperature of your roof can significantly decrease your summer energy bills by using much less air-conditioning. Conversely, heating costs can increase during the cooler months, so you need to consider both the annual weather patterns of where you live, and what other heating solutions you have in your home for colder seasons when deciding if a cool roof is for you. You can create a cool roof when converting your existing roof, or when building a new one, by fitting a waterproofing surface, or applying a sheet covering or other heat reflective material. Regardless of the material you use, you’ll also want your roof to look great, that’s only natural. As such, it is vital you use a top quality paint that will stand the test of time, and maintain the heat reflective properties of the materials. Cool roofs can be susceptible to algae or mould growth in warm and moist locations, while condensation can be a problem in colder locations. By using top quality paint, you can eliminate the risk of potential damage in any environment, thus increasing the roof’s longevity. If you have a flat or shallow-pit roof, a green roof could be perfect for you. By adding a basic lawn covering, or a more adventurous flower and plant garden, you can create an excellent rooftop open space for either your own personal use, or when you’re entertaining friends and family. From an environmental perspective, a green roof helps to manage stormwater, and offers effective insulation that will reduce both heating and cooling costs. Green roofs can be far more expensive to install than a cool roof, but given the advantages in all weather conditions that help reduce utility bills, and potential resale benefits thanks to the added value of the property, it may be a smart investment for the present and the future. Are there government incentives that can alleviate or eliminate setup costs? Does your electricity company support solar power, and will it affect the rates you pay? Will your electricity retailer pay you to feed unused energy into the electricity grid? Government financial assistance is available in two different ways – Renewable Energy Certificates and Feed-In Tariffs (the amount your electricity providers pay you to feed electricity back into the grid), while some businesses may also be eligible for government assistance in the form of grants. By converting part of your electrical usage to solar generated power, not only will you be reducing your electricity bills, but you’ll also be reducing your home’s greenhouse emissions. This carbon-free alternative has an enormous benefit for the environment, and you’ll be playing your part in reducing the effects of global warming. The manufacturing of a green roof should use less energy in development. 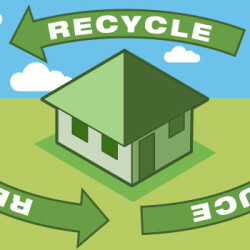 The roof can be completely recycled when it is replaced at the end of its lifecycle. Green roofs that are built using environmentally friendly construction approaches should also include strategies to extend the lifetime of the roof. Replacing your roof less regularly will save energy usage, material construction, and of course long-term costs from utility bills and roof replacement. Insulation is a common consideration for anyone building a new home, or determining ways to decrease energy usage and utility costs in their current home. A well insulated home can have a drastic effect on the need for electrical heating or cooling systems, which in turn reduces your home’s emissions and those nasty utility bills. However, a poorly insulated home can potentially have zero effect, while costing you money for the initial installation costs. Your insulation options will be determined by where you live and the local weather patterns, and the type of house you have. These include high tech solutions such as home foam and cellulose insulation, to basic options such as fibreglass and cotton batting. Reputable insulation companies will be able to provide information about environmentally friendly options so you can enjoy lower bills while using the best materials. Making changes to your home to reduce energy emissions and decrease utility bills in an environmentally friendly way can be done quickly and inexpensively. For example, simply painting your roof in lighter colours can reduce the absorption of heat markedly. Think about your own home for a moment – are there ways you can incorporate any of the above-mentioned solutions into your roof to reduce utility bills and the damaging effects on the environment? By doing your research and creating a simple cost-benefit analysis, you can determine whether the initial outlay will prove financially beneficial in the medium-long term. Chances are making a few subtle changes to create a green roof will be one of the best decisions you will ever make, and both your wallet and the environment will thank you for it.